MILWAUKEE (AP) — Gerrit Cole has all but forgotten a recent four-game stretch where he failed to pitch past the fifth inning. For the second consecutive start, Cole pitched seven strong innings, and the Pittsburgh Pirates beat the Milwaukee Brewers 8-1 on Monday night. He also chipped in with a key hit to start a four-run outburst in the seventh. “He was in attack mode from pitch one,” Pirates manager Clint Hurdle said. Cole (5-6) held the Brewers to one run and three hits. He struck out five and walked two. He gave up one run in his previous outing on June 13 against Colorado. “We made a lot of good pitches and kept them off balance just enough,” Cole said. Andrew McCutchen hit a two-run homer for Pittsburgh and has gone deep four times in his last six games. Travis Shaw’s leadoff homer in the second put the Brewers ahead 1-0 and set a franchise mark, with the Brewers scoring their 16th consecutive run via the long ball. The Pirates took the lead in the third on Adam Frazier’s two-run single off starter Matt Garza (3-3). McCutchen extended the lead with his homer in the sixth that chased Garza, who gave up four runs and six hits in 5 1/3 innings. He walked two and recorded three strikeouts. “I fell into a pattern, threw too many fastballs and he hit it out,” Garza said. Pittsburgh added four runs on five hits in the seventh off reliever Wily Peralta. Cole started the inning with a single, his third hit in 25 at-bats this season, and scored on Josh Harrison’s double. “A lot of times those rallies start really innocently,” Hurdle said. The Pirates scored one of their four runs in the seventh when Brewers left fielder Hernan Perez tripped and somersaulted while attempting to throw home after Gregory Polanco’s single. The ball squirted away from Perez, who was charged with an error. He appeared to injure his right wrist as he attempted to brace his fall but remained in the game after being examined by trainers. Eric Sogard continues to perform at a high level since taking over at second base with Jonathan Villar sidelined with a lower back strain. Sogard, who has a .458 on-base percentage in 31 games with the Brewers this season, is likely to remain in the lineup once Villar returns. “Eric Sogard continues to play at a really high level and get on base at a really incredible pace,” Brewers manager Craig Counsell said. “He’s been a productive offensive and defensive player.” Counsell said “there’s space” to give Villar, who has a .213 batting average, some playing time. “But we’re looking for the players who are helping us win games,” he said. 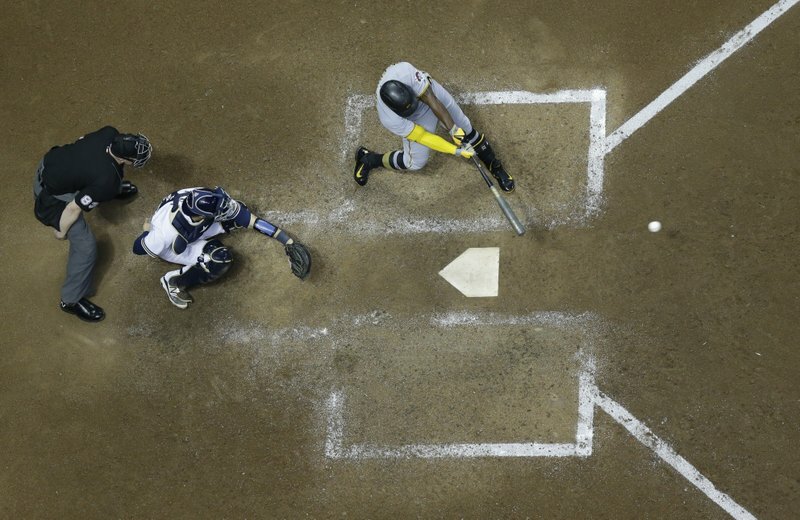 Pittsburgh’s Josh Harrison was hit by a pitch in the ninth. It’s the 12th time this season he’s been hit, tied for most in the National League. The Brewers released reliever Neftali Feliz, who had been designated for assignment Wednesday. Feliz began the season as the team’s closer after signing a one-year, $5.35 million contract. Pirates: RHP Juan Nicasio, who didn’t pitch for two consecutive games due to arm fatigue, was available out of the bullpen. “(The trainers) couldn’t come up with anything structurally,” Hurdle said. Brewers: Villar, who is on the 10-day disabled list with a lower back strain, could begin a rehab assignment this week. … The team took a cautious approach with rookie reliever Josh Hader, who warmed up three times in the bullpen on Sunday but didn’t appear. “It’s very rare that you’re going to have somebody up in three separate innings,” Counsell said. … Sogard was hit on the left foot by Jhan Marinez’s pitch in the eighth. He slowly limped to first base but remained in the game. Pirates: Chad Kuhl (1-6) has lost his last six decisions and hasn’t gone more than five innings in any start since April 18. He is 1-0 with a 1.76 ERA in three career starts against the Brewers. Brewers: Zach Davies (7-3) is 1-2 with a 9.56 ERA in four career starts against the Pirates. He notched his lone win on May 7 in Pittsburgh, giving up two runs in 5 2/3 innings.